In a post back in September, I quickly summarized the abnormalities that can occur with chromosomes as a whole (such as deletions, insertions, transversions, etc). 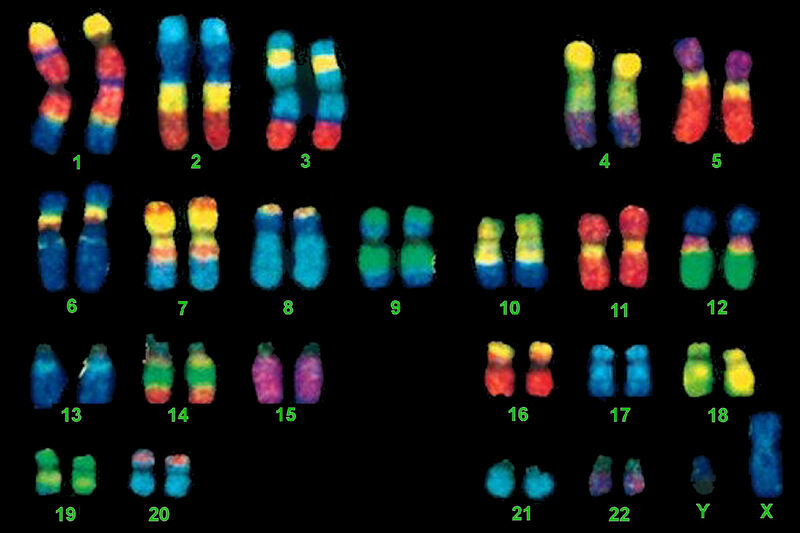 There is so much more to learn (more than I could possibly put into one blog post), because the way chromosomes behave, depends on their structure and DNA sequence. For instance, genes with the same DNA sequence will behave differently depending on where they are located on a chromosome as well as the effect of the surrounding DNA sequence. So how exactly is the immense length of DNA compacted into a chromosome? Let’s take a DNA sequence and see just how it makes up a chromosome. A single molecule of DNA spools around histone protein cores forming bead like structures called nucleosomes. Between each nucleosome is a sequence of DNA termed “linker DNA.” The amino acids associated with histones are lysine and arginine. The super coiled form is compacted and can be visualized as a karyotype in laboratory testing. G-Banding – Chromosomes are stained with giesma stains. The appearance differs based on the treatment of chromosomes prior to staining. Q-Banding – Chromosomes are stained with fluorescent dyes, quinacrine or quinacrine mustard. Q-Band staining is similar to G-banding in that the fluorescent regions represent the AT-rich regions of the chromosome. R-Banding – Results from heat treatment in a phosphate buffer followed by staining with Giesma dyes. C-Banding – Centromere staining that results from alkali treatment. So how do you exactly identify chromosomal location based on banding patterns? This designates a female has a translocation between the short arms (p) of chromosomes 3 and 12 and region 1, band 2, sub band 1; and region 1 band 1 respectively. What do “FISH” have to do with Molecular Biology? FISH, an acronym for Fluorescent In-Situ Hybridization, is a method used to detect and visualize protein, RNA, and DNA structures in the cell. FISH analysis is a relatively fast method that provides great resolution as it incorporates fluorescent probes labeled for detection of specific regions, deletions, and translocations. The images below show the difference between FISH and Karyotype images. Robertsonian translocations are of importance because they involve translocating most of one entire chromosome to the centromere of another chromosome. They can be balanced or unbalanced. A balanced translocation usually results in no health difficulties because there isn’t a gain or loss of genetic material. However, due to the duplication or deletion of genetic material in an unbalanced translocation, syndromes and other malformations are likely to occur. The chromosome pairs common for Robertsonian translocations include translocations between 13 and 14, 14 and 21, and 14 and 15. During a Robertsonian Translocation two chromosomes (typically acrocentric in formation) will break apart at their centromeres. The long arms will fuse to form a single chromosome and the short arms will also join to form a product. Typically the product created by the short arms contains nonessential genes and is eventually lost through cell division. Most people with ROB have only 45 chromosomes in each cell containing all of the essential genetic material and appear normal. An example of a balanced Robertsonian Translocation would be when the long arms of chromosomes 14 and 21 fuse together. Phenotypically, the heterozygous carrier would appear normal because there are two copies of the major chromosome arms, resulting in two copies of the essential genes. However, children of the carrier could inherit an unbalanced translocation that causes Trisomy 21 (Down Syndrome). Which two amino acids are associated with histones? If you wanted to stain chromosomes to see varying regions that were AT-rich, which type of stain would you use? Female patient, with a translocation between the p and q arms of chromosomes 1 and 14, and region 2, band 1, sub band 3; and region 1 band 7, sub band 6 respectively. Buckingham, L. (2012). Molecular Diagnostics: Fundamentals, Methods and Clinical Applications (2nd ed.). Philadelphia: F.A. Davis Company. Searle, B. Rarechromo.org. The Rare Chromosome Disorder Support Group. 1996. Web. 19 Dec. 2015. It’s very interesting subjects. Thank you, madam.